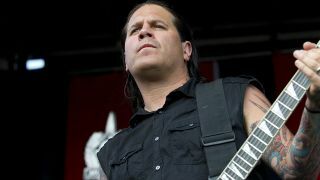 Former Machine Head guitarist Phil Demmel has spoken about receiving a “mind-blowing” text from Slayer’s Kerry King, asking him to join Slayer on tour. Slayer needed help for the remaining shows on the 2018 European tour after Gary Holt returned home to look after his ill father. Demmel received the text from Slayer less than 24 hours after he walked away from Machine Head following the conclusion of their Freaks & Zeroes tour – and it’s a move that he’s looked back on in a new interview with Music Radar. Demmel says: “I think Slayer saved my musical career in some way. In under 24 hours, I went from the last day of a tour wondering whether I was even good enough to be in bands any more, to this mind-blowing text from Kerry King asking if I could play in Slayer. “I guess the reason I’m in this position now is because of the people I had met, almost from a networking standpoint. Since his departure from Machine Head, Demmel has resurrected his Vio-lence project – and has been involved with a few other projects. The guitarist adds: “I want to be honest to who I am as a player. I was already 36 when I joined Machine Head. Then there was 16 years of that and now I feel like I’m just getting started again. “Things are popping up. I’ve done a few guest solos here and there as well as music for video game companies. Demmel’s Machine Head bandmate drummer Dave McClain, who also quit the band on the same day as the guitarist, has now rejoined Sacred Reich.